A campaign to help the world’s hungriest people is stepping up a gear. Launched during Fairtrade Fortnight earlier this year, the “Make Food Fair” campaign, seeks to change the lives of smallholder farmers around the world, and now its Fairtrade Foundation organisers are planning to take a petition to Downing Street. They will be calling on David Cameron to champion a better deal for the world’s smallholder farmers at this year’s G8 meeting which takes place in June in Northern Ireland. The Fairtrade Foundation’s model seeks to show that a minimum price along with access to pre-financing can improve farmers’ negotiating power, empowering them to build business partnerships which in turn enable them to secure fair prices. A minimum price for produce, covering sustainable costs of production, enables smallholders to invest in their farms and communities while protecting them from high price volatility. 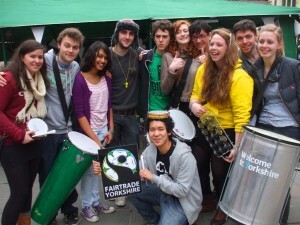 The petition will be handed in just before World Fair Trade Day which is on 11th May. 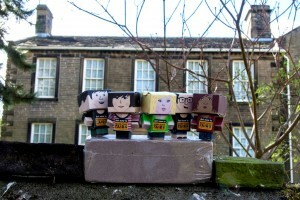 To publicise it, a small army of 5,000 paper mini marchers descended on Parliament Square in London in March. 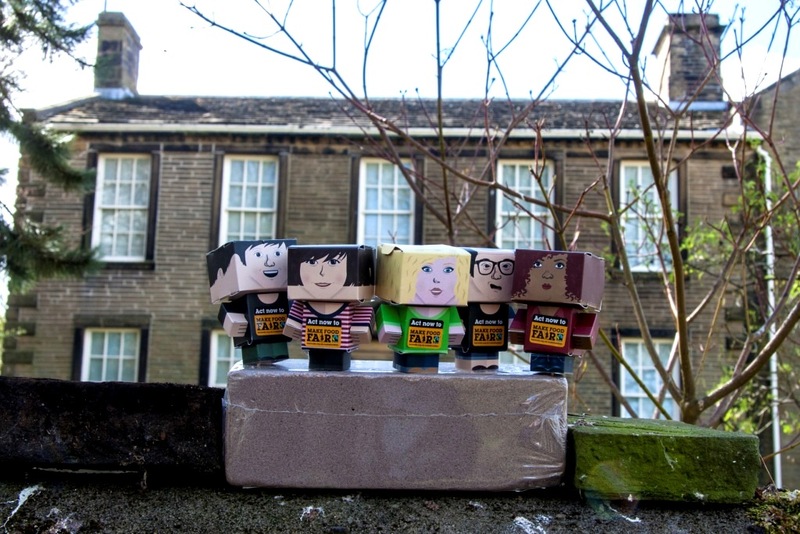 The mini marchers could be customised to resemble their real life counterparts, so Jonathan Ross, Eddie Izzard, Amanda Holden and Tulisa were amongst those represented. And the mini marchers have not stopped yet. Restless in their quest, they are stomping their little paper feet and seeking other allies, travelling around the UK in their efforts to collect more petition signatures. 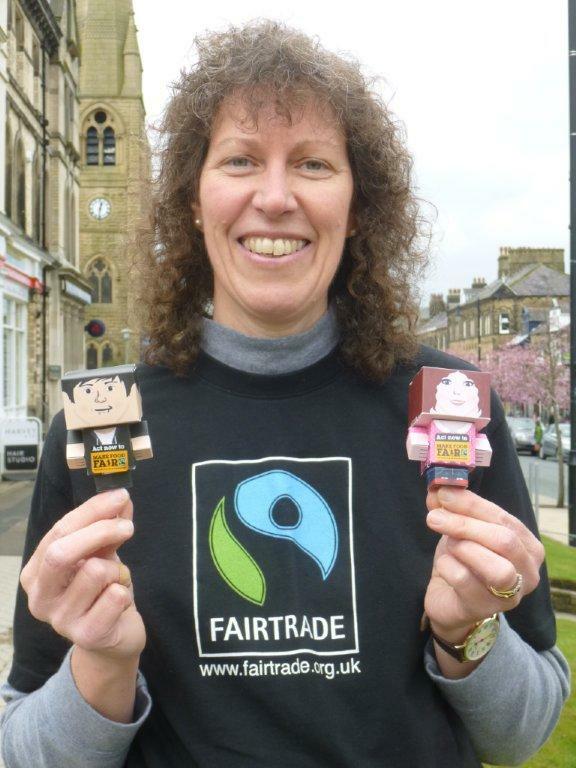 Chair of Fairtrade Bradford and Fairtrade Ilkley, Karen Palframan, will be heading to Downing Street on May 9th to hand in the mini marchers’ petition to David Cameron. She will be able to speak to him about the need for global policies to support small scale farmers. An early signatory to the petition, Mrs Palframan was herself represented by a paper mini marcher and has been invited by the Fairtrade Foundation to join the delegation meeting the Prime Minister. “I am really honoured to have been asked to do this”, she said, “and never dreamt that my support for the ‘Make Food Fair’ campaign would lead me to Downing Street. Our voices can be heard and hopefully we can influence powerful decision makers. Food and hunger are on the G8 agenda, and we must ensure that the farmers providing our food are not going hungry themselves”. Mrs Palframan added, “Let’s unite and make our voices heard even more loudly then they were during the ‘Make Poverty History’ campaign in 2005. I would ask you to sign the ‘Make Food Fair’ petition and also to buy products with the Fairtrade logo as these guarantee a fair deal for farmers”. A number of the Make Food Fair mini marchers have already visited the Students’ Union at Bradford College, which will be encouraging students to sign the petition. 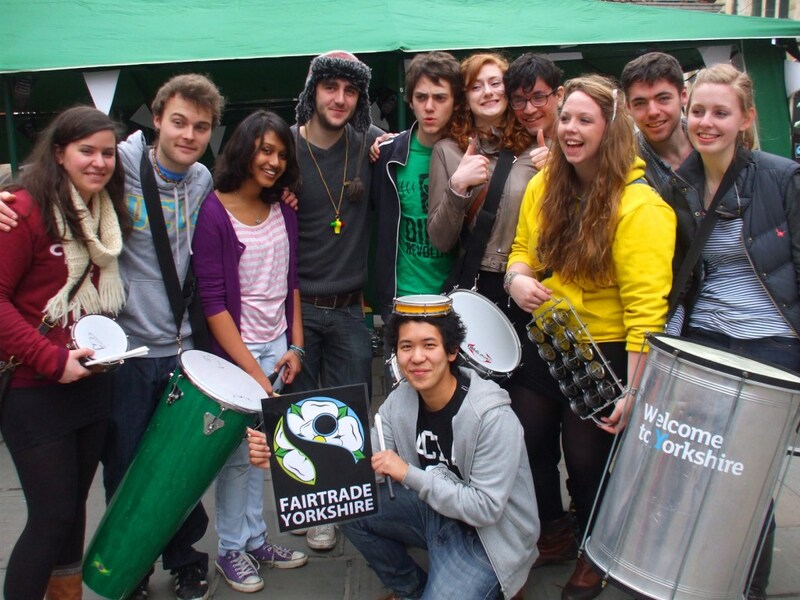 The Students’ Union has an additional campaign underway to gain Fairtrade College status, and SU President, Piers Telemacque, has already collected 1,300 student signatures in support of this campaign. 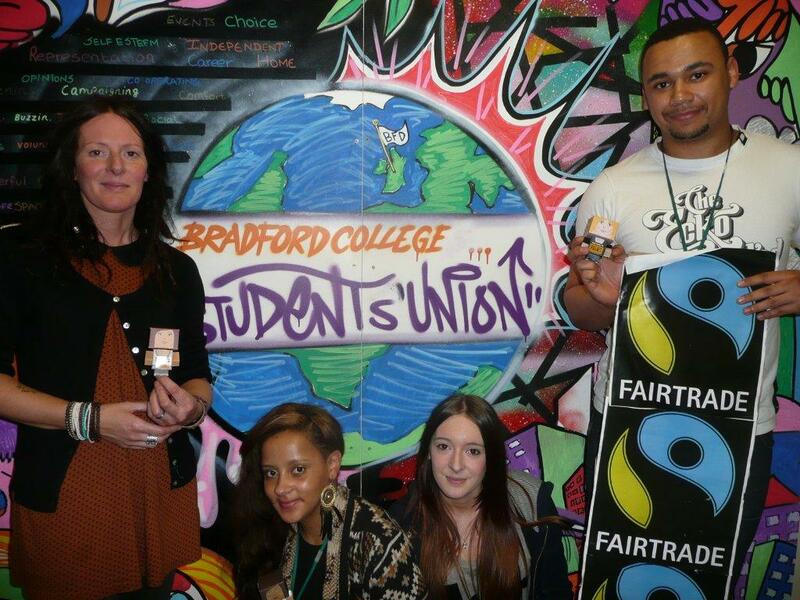 The SU wants to see Fairtrade products used and sold throughout the College, and hopes Fairtrade cotton uniforms can be introduced. If Fairtrade College status can be achieved, Fairtrade would be included in a number of curriculum modules and actively promoted, especially during Fairtrade Fortnight. 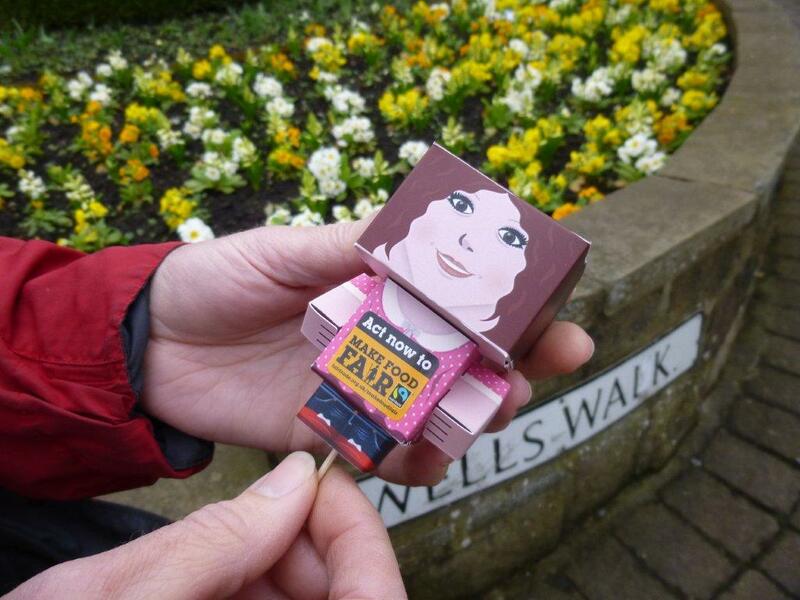 This year World Fair Trade Day is on Saturday 11th May. World Fair Trade Day is an international celebration for the global Fair Trade movement. Do look out for events being held in your local area. Make sure that you sign the Make Food Fair petition which will be handed to the Prime Minister just before World Fair Trade Day. Despite producing 70% of the world’s food, over half of the world’s hungriest people are smallholder farmers. The petition calls on David Cameron to go further and champion a better deal for smallholder farmers at this year’s G8 meeting. During the middle of February, after a year and a half of hard work, Skipton Girls’ High School achieved Fairtrade School Status. The first school in Skipton to be awarded this! Mrs Brailsford and the Fairtrade Friends team have been working together since September 2011, promoting Fairtrade within the school and local community. The students have worked brilliantly together, sacrificing free periods and lunchtimes to have meetings and run events. Now the school has Fairtrade Status, the group has to continue and build on previous activities, as well as aim to introduce it in new subject areas. 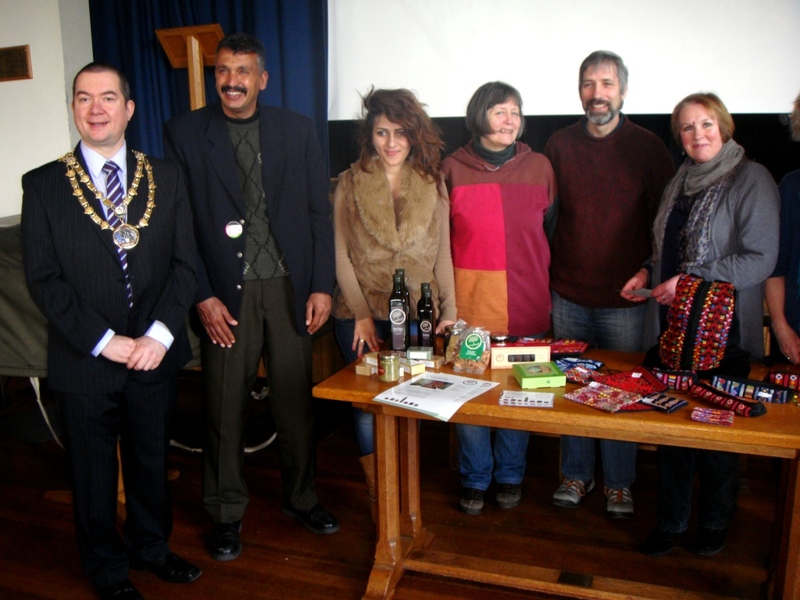 Since September 2012, the Fairtrade Friends have organised the very successful Fairtrade Fashion Show, baked and sold Fairtrade goodies, and ran a Fairtrade Stall at the Christmas Concert. During this year’s Fairtrade Fortnight, the Friends worked with Greatwood Primary School. At first, they were quite nervous about running activities with the young students. However, once in the classroom, their confidence and enthusiasm shone through, and they received praise from the teachers they worked alongside. The Friends split into two teams. The first team worked with Year 2, and spent one session introducing Fairtrade and producing Fairtrade fruit bowls, and the second session designing new Fairtrade chocolate bars with the students. The second team worked with Year 5, and spent their first session producing Fairtrade footprints and flags of Fairtrade producing countries, and the second session running the Fairtrade cocoa bean game. The artwork produced by the primary school students were put on display at their Fairtrade coffee morning for their parents and the local community to see. Fairtrade supporters joined with other campaigners for social justice at a Human Rights event in York. 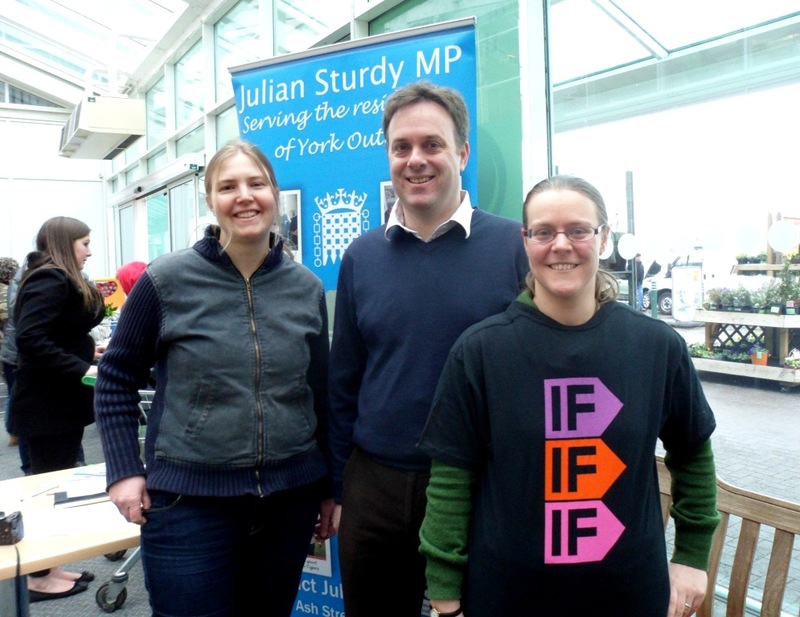 The open day for the York Human Rights City Project was held in Parliament Street on April 20th and drew in over a thousand people. The York Human Rights City Project is a network that aspires to a community based approach to social justice and human rights, linking the local to the global. There was a large variety of Fairtrade products on sale at the Fairer World stall and York Fair Trade Forum set up an information stall. 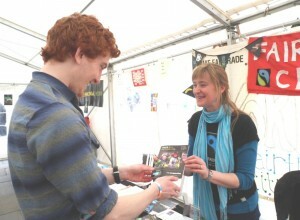 Several hundred copies of the new Fairtrade York map leaflet were given out to York shoppers. 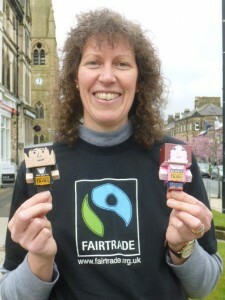 Could Skipton win the race to be the first town to declare Fairtrade status since Yorkshire became a Fairtrade Region? 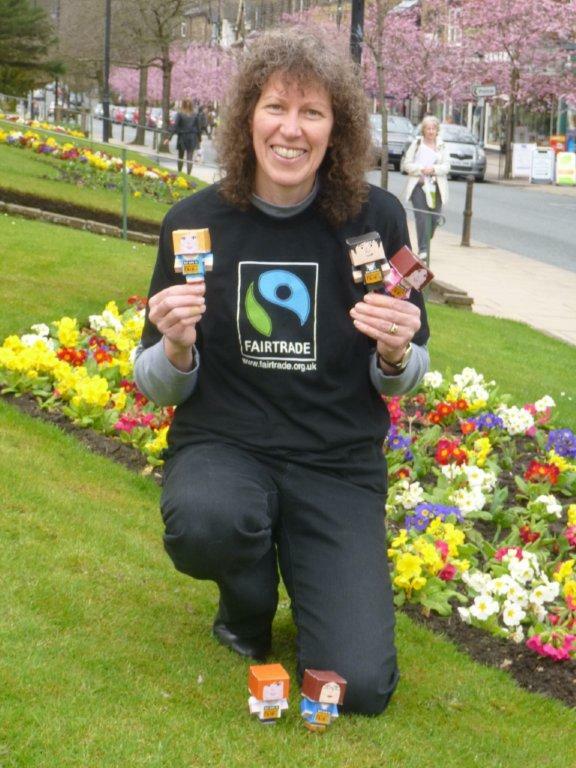 There has certainly been plenty of Fairtrade activity in the town and Liz Roodhouse, Chair of Fairtrade Skipton, is confident that status is not far away. 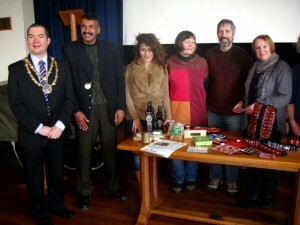 The Chair of Craven District Council, Odeh, Manal and Skipton Fairtrade supporters. During Fairtrade Fortnight, the town played host to Palestinian Fairtrade olive farmers, Manal and Odeh, from the Zaytoun cooperative. They were welcomed by Chris Harbron, the Chair of Craven District Council. 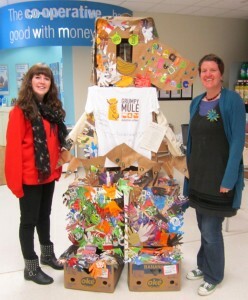 Fairtrade Skipton encouraged supporters to sell Fairtrade rice as part of Just Trading‘s rice challenge. Quakers in the town put on a delicious Fairtrade lunch using the rice. Skipton schools have been hard at work to spread the message of Fairtrade. Skipton Girls High School has recently been declared a Fairtrade School and Ermysted’s Grammar School were visited by Manal and Odeh. Fairtrade Skipton have worked closely with the Craven Development Education Centre which is based in St. Andrew’s Church Hall in Skipton. 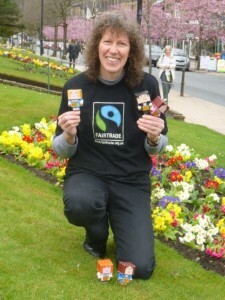 Fairtrade Yorkshire wish Skipton all the very best and this is one race that we will be watching very closely. Go Skipton! 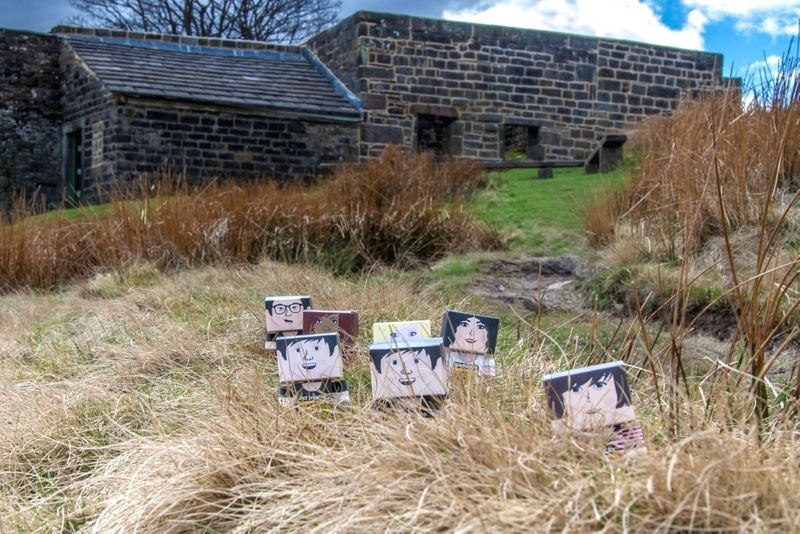 During Fairtrade Fortnight Holmfirth based business fairandfunky teamed up with The Co-operative Pioneer to host exclusive workshops with schools and shoppers. 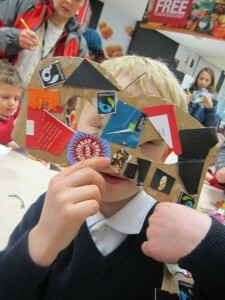 The focus of this year’s Fairtrade Fortnight campaign for 2013 was food, and the challenge from The Fairtrade Foundation was to get creative with Fairtrade packaging. So fairandfunky did. During the fairandfunky schools workshops, over 60 children were taken Fairtrade Sleuthing around the supermarket, before creating Fairtrade Super Hero masks from recycled Fairtrade packaging. 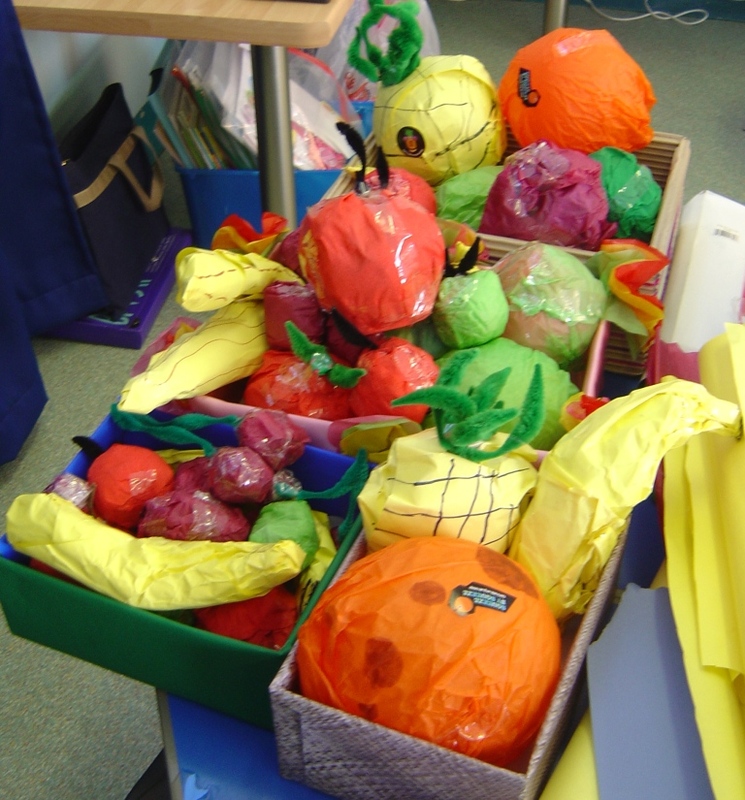 Children were treated to delicious Fairtrade fruit and as they tucked in they learnt that they have the power to change the world by buying and eating Fairtrade fruit. They are Fairtrade super heroes. The children were then invited to draw round their hand and cut it out to decorate the giant Fairtrade farmer. This they loved, and many returned later in the week to find their hand, tell their parents, and then go shopping for Fairtrade products. The invitation to “lend a hand” continued in two drop in workshops for every day shoppers, which included local MP Jason McCartney. The result: a GIANT Fairtrade farmer. The workshops were possible thanks to funding from the West Yorkshire Co-operative Area Committee. fairandfunky is a local Community Interest Company Co-founded by Helen Robinson and Sophie Bebb. Empowering people to take little steps to change the world, fairandfunky delivers interactive and creative workshops on global themes to schools and community groups. They also sell fair and funky products at www.fairandfunky.com. Creative youngsters at St. John’s church in Ben Rhydding have made their contribution to ‘altar’ the way we trade. 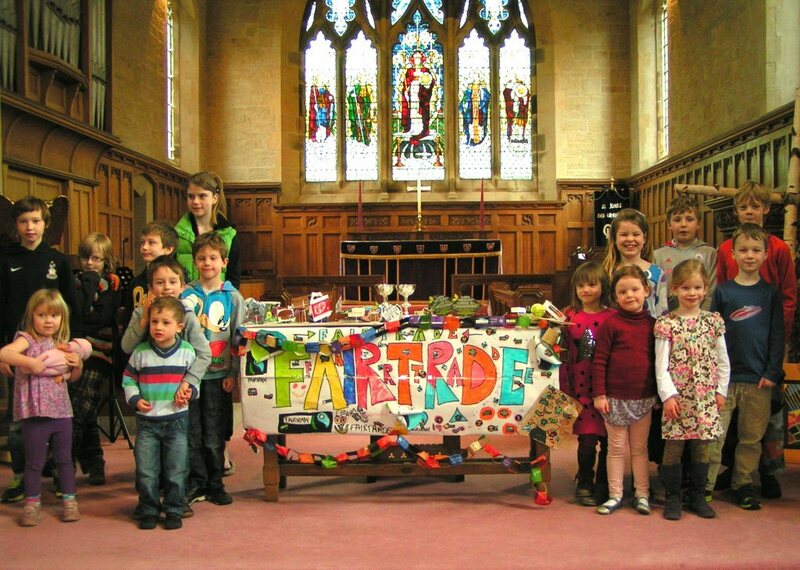 Challenged by the Fairtrade Foundation to use Fairtrade packaging to create works of art, the children of Ben Rhydding designed and created this beautiful altar cloth. Worshippers at the church will be reminded of the need for fairness and justice in trade. Well done to the St. John’s youth group for all their hard work and creativity. This food justice campaign seeks to make the changes necessary so that no one need suffer from hunger. In the past month, thousands of IF campaigners across the country have been visiting their MP’s to lobby for food justice. Food campaigners Majimcha and Jenny visited their MP, Julian Sturdy, who represents York Outer. They called at his surgery at Monks Cross on the edge of York. IF campaigners were pleased to see the Government stand by its international commitment on international development aid levels. This is vital if we are to eradicate hunger, but of course, there are many countries that need to be persuaded to honour their commitment as the UK has done. Majimcha and Jenny spoke to Julian about transparency regarding tax arrangements for multi national companies. The world’s poorest countries lose out on tax revenue due to sophisticated avoidance schemes employed by many wealthy corporations. The UK is hosting the G8 summit in June this year, so our government has a real opportunity to change international policies to benefit the poor and hungry, including changes to the international tax system.